The Federal Government is committing $2.9 million dollars to Indwell's Blossom Park Affordable Housing Complex in Woodstock. WOODSTOCK - The brand new affordable housing units from Indwell on Blossom Park will be ready for the Spring. Today the Federal Government announced $2.9 million dollars in funding from the National Housing Co-Investment Fund for the project. The entire project will $7.25 million dollars with funding from all levels of Government and private donors. Liberal MP for Spadina, Fort York, and the Parliamentary Secretary to the Minister of Families, Children and Social Development Adam Vaughan made the announcement this morning. "We had donors here, we had municipalities here, there is Provincial money on this site, there is Federal money at this site, when people work together, when governments work together, you can help people and you cannot just help getting people housed, but look at the age of folks working on the project. It creates jobs, it creates housing, it creates an energy efficiency, there is no bad news here, it is just win, win, win all the way around. I want to give big shout out to the local community for pulling this off." Vaughan says the NHCF was created for projects just like this one. "We believe everyone deserves an opportunity to succeed and this is why we are extremely happy to be supporting this wonderful project through the National Housing Strategy. Having a safe and affordable place to call home is the basic foundation that will enable the furniture tenants of Blossom Park to focus on their health and being to build a better life for themselves." 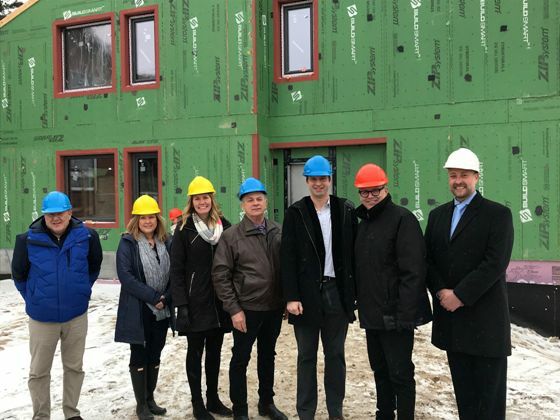 The 34 affordable housing units are being built to passive house standards, meaning they will achieve energy savings of 57.9 percent and reduction in greenhouse gas emissions by 55.3% compared to the NECB in 2015. All 34 units and common areas in the building will be accessible through universal design and 7 units will be fully accessible. The units will be affordable and will have a rent representing 57% of the median market rent. Executive Director for Indwell Jeff Neven says this project will make a difference in the community. "This project brings permanent supported homes to those in Oxford County with complex mental health and health concerns. We're thrilled with the announcement of this funding, it represents the care and concern of Canadians for some of our most vulnerable neighbours. Working together with government, faith communities, and private and corporate donors, we can create hope and homes for all." Neven adds they are looking to have all of these homes furnished for the new residents this Spring and are still accepting donations from the public to help make that happen. Major fundraising announcement for the construction of 34 affordable housing units at Blossom Park in Woodstock. Story to follow.